Today, I decided to check out the Chocolate Rush Festival, which is running in Melbourne this weekend. I wasn’t originally planning to blog about it (I’ve read not one, but *two* food-infested novels in the last two days which I am itching to review here), but parts of it were really good (truffles!! lollipop workshop!) and other parts were extremely frustrating (showbags, venue), and it had a very different feel to the Festival I attended a couple of years ago. So it seemed worth writing about, especially for those of you who are still deciding whether you plan to give it a try tomorrow. The first thing you need to know is that I am quite cranky and tired at present. And that the day started with me running to a train and missing it, and then running to a tram, and missing that. And when I finally got into the city, it turned out that the Bourke St trams weren’t running, which meant a long walk across the city and into the Docklands to find the festival. So by the time I got there, my ankles were sore and I already had a headache and honestly, if it hadn’t taken me nearly two hours to get there, I’d probably have turned around and gone home when I found out that the entry fee was $30 at the door (it’s $25 if you pay online, but then you are charged a $2 booking fee, which is why I got cranky and didn’t pay online). I decided to shell out an extra $20 to attend a chocolate lollipop making demonstration, on the grounds that at least if I got to touch some food I’d end up in a better mood, but my mood went downhill again when I paid a gold coin donation for the showbag which turned out to be… a bag. With the program in it, which you could also get for free. That really annoyed me, to be honest. All of which is to say that I feel the entry fee was rather steep, especially for a venue that was not very accessible, quite ugly and very noisy (the demonstration next door to our class was so loud that our instructor had to wear a microphone to be heard, despite being in a small area with only 19 people clustered around the table). Disappointing. And they definitely had fewer stallholders than when they were at the Showgrounds a couple of years back. On a less embittered note, I do think that venue was a mistake for the organisers, too – the big metal shed ambiance did not invite one to linger; and even though I was really interested in several of the stalls, I kind of visited everything as quickly as I could because I wanted to get out of that loud shed. Those are the negatives, which I mention first principally because they were also my first impressions. There were, however, positives, the first of which was the lollipop making class. It was only a 20 minute demonstration (sigh, they had proper 2 hour workshops last time I went, which were fantastic), though it kind of stretched out to nearly 40 minutes, but the chocolatier running it was great. He’s one of the teachers at Savour School, so he knows his stuff, and could answer questions about how long things would keep but he was also a lot of fun. 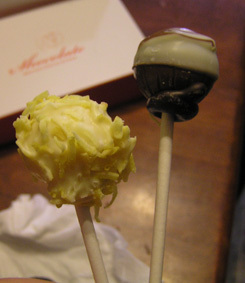 Basically, the lollipops we were doing were Truffles On A Stick. Nothing wrong with that. The truffles (orange and cointreau, and a passionfruit and malibu one) had been pre-made (we had the opportunity to copy down the recipes, but I didn’t have a pen and paper, which was OK – I’m going to Savour on Monday anyway, so I’ll ask for them then), and basically what we got to do was dip them in two kinds of chocolate, or in chocolate followed by coconut that had been impregnated with passionfruit puree. Yum. So he talked us through the process of making them (with a bit of a brief plug for things one could get at the Savour shop, and fair enough too), and then we all stood around dipping lollipops and asking questions. Very soothing. Also, we got to listen to our demonstrator’s banter about how a survey had recently shown that Irish accents were much sexier than French accents (our demonstrator was Irish, and the chocolatier next door who was just passing by was French) and how the French didn’t know how to make chocolate lollipops (the French chocolatier looked sarcastic at this, but not as sarcastic as he looked when our demonstrator tried to speak in a French accent.). And we each ended up with about 6 lollipops to take home rather than the two we were supposed to have – bonus! Feeling much refreshed by this, I went off to see what the French chocolatier was up to. He’s from a store called Shocolate, which I have not previously heard of but which clearly deserves my attention, and not just because I completely disagree about the Irish vs French accent thing (one of the minor perqs of my job is getting to eavesdrop on all the lovely French postdocs and RAs with their gorgeous accents. I love my German postdocs too, but the French accent wins every time). For one thing, he makes Vegemite truffles. Naturally, I had to know what they tasted like. 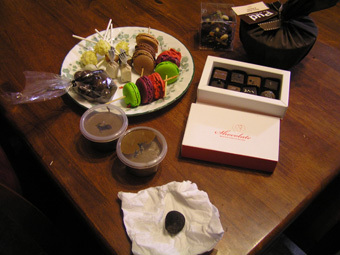 They came in a box which I like to think of as chocolate roulette, because it was a whole collection of flavours ranging from the conventional (dark chocolate truffle) via the fascinating (passionfruit, white sesame, salted caramel) to the deeply weird (vegemite), none of which are labelled. Awesome. I got a box each for myself and Andrew, so that we could figuratively hold hands as we jumped off this particular culinary precipice. Yes, but which one has vegemite in it? Oh, you want to know how they taste? Well, this is slightly difficult to answer, because I am not 100% certain that the one we just tried was the vegemite truffle (the lady behind the counter pointed it out to me, but there were three quite similar chocolates and I don’t know which it was), but if it was, it tastes a bit like salted caramel. Unless, of course, we just tried the salted caramel. That’s the trouble with Chocolate Roulette – you don’t really know what you are eating, and if the flavour is unusual enough, it’s difficult to identify. I shall report back once we have tried the other, similar-looking chocolates, just in case one of those is distinctively vegemitey. Anyway, vegemite truffles were not the only charm of that particular store. They also had macarons-on-a-stick, which were irresistible, despite their unlikely colours, chocolate coated freeze-dried raspberries (which are precisely as good as they sound), and rather delicious dark chocolatey things studded with pistachios, almonds, candied orange and violet. Yum. Delicious dark chocolatey things with things in them. Sorry, my vocabulary has been stolen by all the chocolate I’ve consumed. Then I went around the corner and discovered another macaron shop, and had to try their violet macaron, which was incredible. I’m very sorry, but I have no idea what the stall was. My tip, however, would be to get your macarons at the place where they are not on a stick but do come in an astonishing variety of colours and flavours, because they were very, very good. I stayed a while watching one of the demonstrations on making chocolate flowers, which was fascinating but principally filled me with the urge to sign up to every single Savour class in the world, and I’m already going to one of those on Monday, so no, and then moved on to the store which was the real reason I’d decided I was going to this festival – Aussie Truffle Dogs. Truffle, as in the fungal kind, not the chocolate kind, though they had those, too. I’ve never actually cooked with truffle before. 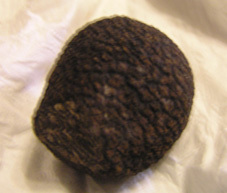 I’ve used truffle oil and truffle salt, and enjoyed both, but I’ve never played with an actual truffle. This store was fascinating because not only did it have actual truffles for sale (which, I might add, look exactly like chocolate truffles which have been rolled in chocolate sprinkles), but you could also by chocolates flavoured with truffle, truffle honey, truffle-infused eggs (in a jar, with the whole truffle still in there – absolutely the best bargain on offer, but the thought of trying to get that home on the train filled me with horror), and truffle-infused chocolate mousse, with grated truffle on top. I mean, those eggs! You could, as the woman cheerfully explained to me, have your truffled scrambled eggs for breakfast tomorrow, then pop your truffle into a jar of rice for a few days to infuse that, or into some more eggs, for that matter, before using it. I wonder what else would benefit from a truffly infusion? Quinoa? Polenta? Probably not flour or sugar, though I bet some restaurant somehwere has tried it. Popping corn would be awesome, and of course one could grate it into homemade butter, but I just love the idea of infusing everything I can think of with truffle aroma before I use it – because yes, I did buy a whole truffle. And some truffled chocolate mousse, because how could I not? Especially after the woman lifted the lid so I could smell the intense smell of it. Of course, now I also have a truffle-infused handbag, despite the layers of wrapping. I think I’ll live. And no, I don’t know how to describe the smell of truffle, I’m afraid. Heady? Powerful? Savoury? A bit like old socks? Just… overwhelming in some way. You feel as though you are using more than just your nose when you smell it – there ought to be another sense involved at the same time. A special, truffle-specific sense. Wow. But good, definitely good. As for the truffley chocolate mousse? Well, it’s certainly one of the stranger things I’ve eaten. 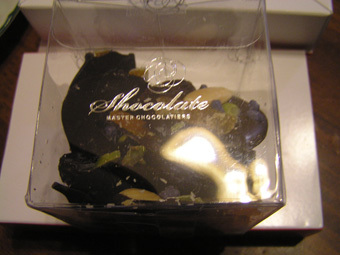 Oddly enough, the flavours do work together, and the truffle gives the chocolate a sort of smokey, heady flavour. I can’t quite decide what I think of it, but I keep sneaking more mouthfuls to try to figure it out. I suspect it is actually exceedingly good. But also odd. I’m very glad I’ve tried it, and I’m rather tempted to infuse some eggs with truffle and try making my own version with an even darker chocolate. My, that’s an odd flavour, though. After that, though, I thought I’d better get some normal chocolate. It seemed possible, after all, that Andrew would like to eat something that tasted like chocolate, not truffle or vegemite. And there was no guarantee I’d like these bizarre flavours, either. So I went out and had a palette-cleansing cup of strawberries and bananas with warm melted chocolate, and then went to investigate Pud for All Seasons, who had their marvellous chocolate rum and raisin pudding for sale again. Score. And at that point, I decided I probably had enough chocolate and should start making my way home. There were, in fact, any number of fascinating stalls which I haven’t mentioned. One woman, for example, specialised in Australian flavourings in her chocolates, which looked fascinating; another, quite cannily, was selling nuts, oranges and tangellos, for those who were all chocolated out. And I think there were some interesting cooking demonstrations going on, but the crowds and the noise drove me out. Then again, I have a low tolerance for crowds and noise; others might have enjoyed this more. I am, on the whole, glad that I went. I did feel it was a little overpriced and that the venue did them no favours – I’m hoping they will return to Abbotsford Convent or the Showgrounds next year – but there were some really interesting stalls there, and even a twenty minute Savour class is worth attending. And you should totally try the truffle-infused chocolate mousse, if you can (it’s actually one of the cheaper things on offer, too which is rather astonishing). Don’t be alarmed if it smells completely weird – it tastes much better than it smells. And it’s kind of addictive. Definitely something you should try at least once in your life. Yes… I heard a couple of other people complaining about it (they’d booked for the class, and somehow missed the fact that they would have to pay an entry fee, too – ouch.). I’m in two minds on whether it was worth it. I mean, yes, it was great to have so many interesting stalls in one location, but I’m used to farmers’ markets now, where you also have lots of interesting people in one place and the occasional free sample, but don’t have to pay $30 to get in. I think if I were more interested in watching people cook things I would have got more value for money. But truffles, no matter how weird the word is, are awesome. Its a shame it was expensive and noisy, I hate noisy too. Koko Blacks is my absolute favourite chocolate shop! Sadly, they weren’t represented there. And I quite agree with you about macarons – you have to have them at room temperature!